HE POINTS OUT THE BETTER PHASES OF BRAHMANISM. AND DELIVERS A POINTED MESSAGE TO CHRISTIANS. Swami Vivekananda, the Brahman monk addressed a most interested audience Tuesday night in Library Hall under the auspices of the Lawrence Woman's Club. Miss Wetherbee introduced the speaker and prepared the way for a cordial reception which American courtesy rarely fails to give a distinguished visitor from another nation. Miss Wetherbee wisely referred to him as a prominent personality at the World's Parliament of Religions, also to the strong impression made by him at the World's fair. . . .
. . . In his own country, in his own class, he addresses all women as mother. The Brahmin is educated thus to think of women as mother and a man may not marry his mother. In that country the mother instinct is developed in woman; in this he thought the wife instinct was cultivated, and the most beautiful thing in his lecture was his tribute to the mother, and not unnoticed was the reference to the kindness of heart of the little Hindoo child which would instinctively cause him to turn aside from his path rather than crush a worm. formed a large part of his lecture. Among the high classes, called Aryans, women think of marriage as indecent [?]. A widow is not expected to ever marry again. A man who never marries, is highly praised, and indeed worshipped, but should he marry then in the minutes all would be changed. He who does not marry is looked upon as high-minded, as holy and spiritual. Among the Aryans no money is paid in marriage [? ], and as female children are largely in the majority it is one of most difficult things for a father to marry his daughter, and from the time of her birth he racks his brains to find her a husband. With the two lower classes the rules in regard to marriage are all different. Widows marry again and wives and husbands if desirous become divorced. When a child is born an astrologer comes and casts a horoscope of the child, he delineates the future character of the boy or girl — it is decided whether he is manly or a devilish child; if devilish — he is married to one next in caste, and thus is obtained a minute chance of bettering the condition of the devilish child. We are all preaching sermons into them, when their hands are reaching out for bread. Poverty is so extreme in the lower classes that fifty cents a month is the average income of a Hindoo. Millions live on one poor meal a day and millions subsist on wild flowers for food. that had been written by a woman excepting his own country alone where many beautiful things in their Bible had been written by women. We have seen the Greek and the Persian come to us — we have seen the Spaniard with guns come to make us Christians, still we are Hindoos and thus we shall remain. I dare here in America to say that we of India shall stand by our religion. He said our customs were good for us and we were welcome to them. He stood before us as he has before many a cultured American audience — he, the learned exponent of the Brahman religion, the only Hindoo who has ever come to this country to tell us — as forcibly as he dared and as politely as he could and yet be forcible, — to say no more to the poor Hindoo but to be so very kind as to mind our own business. 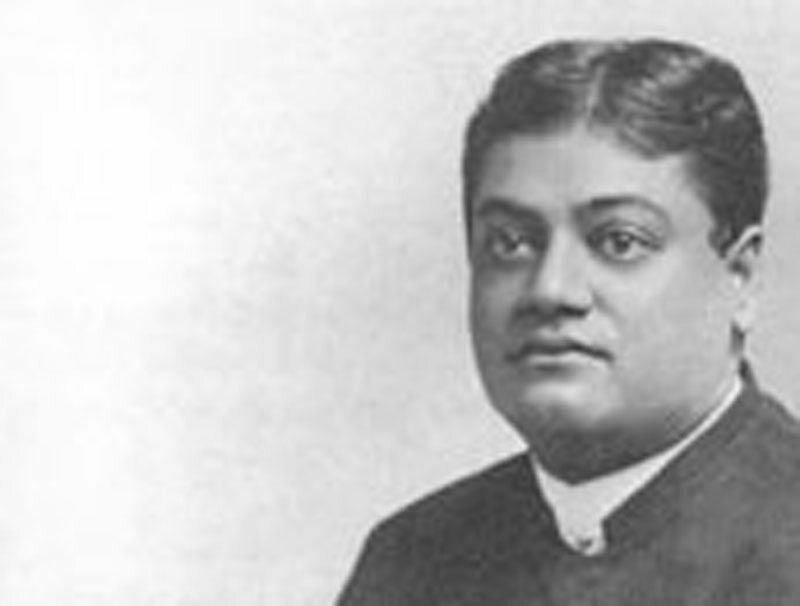 After the lecture many of the audience gladly availed themselves of the opportunity offered by Mr. and Mrs. Young to meet Vivekananda at their residence where he has been entertained and has proven himself to be a most delightful guest.